A number of new products are being prepared for release, but because they are linked the order in which they are phased in is important. The lead products have been in preparation for over 6 years, but their manufacture is a complex operation and it has taken longer than we had hoped. We now expect that they will be manufactured before the end of 2017 and during the course of 2018 new products will steadily become available. Our assessment of existing sound transmission, recording and reproduction concepts has also taken up a lot of our time. We hope to bring the results of our study to the attention of readers later this year or in 2018. You have no doubt heard about the outcome of the UK referendum, and the decision of the British people that the UK should, over the next 2 - 3 years, leave the European Union. This result was unexpected in the world's financial markets, and whilst we believe the UK will, in the longer term, be even stronger, there are many uncertainties in the world's financial markets at the moment that have caused a fall in the value of our currency. This will therefore provide a good opportunity for overseas customers to purchase goods from the UK at a significantly lower cost in the short term. Ringmat Developments has not increased prices since October 2013, and even then there was little change, as prices have largely been held the same for well over 10 years. We have absorbed a number of cost rises in our raw materials and not passed them onto our customers. However, following the UK referendum result last week, it may be necessary to increase some of our prices in the near future, as overseas suppliers to our suppliers in the UK will be charging higher costs as a result of changes in currency relationships. We hope not to make price changes to our standard products for the time being, as we have reasonable stocks of materials at the old prices, but there will come a time when fresh materials will have to be ordered. In the meantime, should we be forced to make a sudden price increase in any of the products ordered online, we will inform our customers of that increase before processing the order. Carriage costs will, inevitably, also rise, but will be notified to our customers where necessary - this is already our current policy for overseas customers. We intend to issue a new price list when the situation becomes a little clearer and more stable, and we know what our suppliers will be charging us for materials. We plan to keep calm and carry on with business as usual. The last day for despatch of Ringmat orders before Christmas will be Thursday 18th December, and it would be very helpful if orders could be placed by Tuesday 16th in order that requirements can be met in time. If for some reason despatch before Christmas is not possible we will inform you. The Ringmat office will then be closed until 5th January 2015. We wish all our customers and very happy Christmas and peaceful New Year. We have not reported any news recently for the simple reason that we have been too busy with orders. In rare moments, we have managed to make some progress with developing new products (we have a long list of them) but have not had the time to bring any of them to a stage where they can be marketed. We are also conscious that we need to complete our work on our ‘Blueprint for the Future’ papers, but again we have not had the time. However, there is a connection between the ‘Blueprint’ and the new products we are developing, so the new timescales may, in the end, prove beneficial. For example, the ‘Blueprint’ will highlight a number of existing problems with accurate sound reproduction, and therefore listening enjoyment, but then our work on new products will limit that damage and therefore the extent of such damage will have been lessened by the time we finally report. As readers will appreciate, we work on improving sound reproduction in both digital and analogue domains. As we make an improvement in, say, the digital domain, we immediately seek to make a corresponding improvement in the analogue domain, and vice versa. This ‘battle’ between the two domains can be very exciting as we constantly try to ‘raise the bar’ in both listening modes. Of course, comparisons have to be made in relative terms, because of the fundamental differences between the two modes, and the respective software. Nothing can be ‘absolute’ in sound reproduction terms, especially as we are always learning. Every few weeks, we improve reproduced sound in our listening room by leaps and bounds and each time wonder if it can get any better, but we always seem to find something new. There are always areas we know that need to be looked at. Of course, in time these improvements will be made available to the public, either as products or as concepts for system building. We aim for accuracy in reproduction, as this is the only sure way of improving musicality and, therefore, musical enjoyment. Thereafter, the user can factor in personal preferences. We should also mention that the Ringmat office will be closed from Friday 11/07/2014 until Tuesday 22/07/2014. The last day for despatch of Ringmat orders before Christmas will be Thursday 19th December, and it would be very helpful if orders could be placed by Tuesday 17th in order that requirements can be met in time. If for some reason despatch before Christmas is not possible we will inform you. The Ringmat office will then be closed until 3rd January 2014. We wish all our customers and very happy Christmas and peaceful New Year. A new October 2013 Ringmat Price List has been posted, along with appropriate changes at our On-Line Store. There are not many changes, as we have continued to keep our prices down at a time of increasing costs. Any product ordered from our Ringmat Essentials Price List before the end of September 2013 by customers in the UK will be discounted by 20%, together with free postage & packing. Orders may be placed by telephone, 01729 823 873, or by using our secure On-line Shop. Orders placed via our Website On-line Shop will show the full price plus postage & packing, but the appropriate deductions will be made by us at point of sale. As we have not exhibited at recent Hi-Fi Shows, this Special 'Limited Period' UK Offer is, in effect, our 'UK Show Price'. If you have any queries or need advice on which product to order, please feel free to contact us first. We will shortly be publishing a new Price List, so take advantage of this Special Offer now. We congratulate Electrades Audio and wish them every success in their new showroom. Ringmat Developments will be represented at the Show by our distributor, HiFi Part, who will be found in Booth No. F3 on the 3rd Floor. They will demonstrate a range of Ringmat products which will be available for purchase at the show. Another excellent feedback from a customer, which we have included here. The new Real Ale version of our Gold Spot Anniversary has been out on successful audition for several months and has been supplied in response to all Ringmat Gold Spot orders for that period. In that time, we have had a wonderful feedback, and a flavour of this is contained in two reviews, which we have included here. We are pleased to announce a new version of our most popular, and most advanced Ringmat, the Ringmat Anniversary Gold Spot. For the time being, it is available at the same price as the previous Anniversary Gold Spot. See here for more details. Our new On-Line Store arrangements have now been working for a month without a problem. We are currently updating the way some of the products in the Store are displayed, adding more pictures, etc. A wholesale revamp of the On-Line Store website is also planned. However, these are major projects that will take time, so please watch this space over the next few months. In the meantime, we will shortly release further information about new products, some of which are already being supplied, with excellent feedback. Welcome to our new look website. We hope you find it a big improvement over our previous design. Although the site is almost complete, we do still have some new product pictures to add to our Price list page. Also at time of writing we haven't been able to do a full check on all hyperlinks within the site. If you find a bug please report it directly to our webmaster who will repair the fault as soon as possible. Please include the page affected and details of the link at fault. The only known issues are a couple of links that link back to now archived news items, and due to the method of archiving it's impossible to take you straight to the article. This website has been designed to work first and foremost with Internet Explorer 9 or higher, however it should work correctly with all other web browsers. KLIAV-2012 takes place on Friday 20th July to Sunday 22nd July 2012 at the JW Marriott Hotel in Jalan Bukit Bintang, Kuala Lumpur, Malaysia. Ringmat Developments will be represented at this Show by our distributor, Electrades Audio, who will again be found in Room 7037 (Level 7). They will demonstrate the full range of Ringmat products which will be on sale at special Show prices and will include Ringmat Vivacity AR Anti-resonance Equipment Platforms, Ringmat Feet & Domes, Ringmat for LPs/Turntables and LP & CD Statmats, Statfeet, and Ringmat Speaker Cables, Interconnects & Power Cables. Ringmat Developments will be represented at this Show by our distributor, Chalit Sukpluemthaworn of HiFi Part who will be found at Booth No. F24. Chalit will be displaying a range of well reviewed Ringmat products, such as the Ringmat Spike Stoppers & Domes, Statmat CDi Blue Plus, LP Blue Statmat + Statcap, and the well known Anniversary Gold Spot Ringmat, and our Vivacity AR Equipment Platforms. We continue to be happily settled in our new location and have been very busy. So much so that the plan to introduce a new price list will now be put back to the early months of 2011. UK VAT rates increase to 20% as from 4th January 2011 and this change will be implemented in our invoices from that date to those areas in the EU, including the UK, that are subject to UK Value Added Tax. Unfortunately, will not have time to change our price lists beforehand, but our prices excluding VAT remain in force, as set out on our prices page. We continue to be very busy with research and hope that before too long we really can publish some more news about new products and related matters. KLIAV-2010 takes place on FRIDAY 23RD to SUNDAY 25TH JULY 2010 at the JW Marriott Hotel in Jalan Bukit Bintang, Kuala Lumpur, Malaysia. Ringmat Developments will be represented at this Show by our distributor, Electrades Audio, who will again be found in Room 7037 (Level 7). Electrades Audio will be demonstrating the full range of Ringmat products, such as the Ringmat Vivacity AR Anti-resonance Equipment Platforms, Ringmat Feet & Domes, Statfeet, Speaker Cables, Interconnects, Power Cables, Ringmats and CD Statmats, etc. Also, Ringmat products will be on sale at special Show prices. We have now settled happily into our new business premises and as from Wednesday 21st April 2010 we will resume handling all new orders as usual. We much appreciate the help given to us by Moth during the move and settling in period. Any overseas orders from countries where there is a local distributor will, of course, be referred to that distributor, in line with our normal policy. We have now successfully moved and are very busy with all the things that need to be done to get the business organised at our new location. You will see from the Contact page our new address and telephone number. Orders have continued to pour in and there is now some backlog that will take a little while to clear. For the next week or so, to give us a bit more time, orders will continue to be dealt with by Mike at Moth, who has done a sterling job in holding the fort for the past few weeks. On the 26th-28th February the Bristol Show takes place at The Marriott City Centre Hotel. Russ Andrews Accessories will be in rooms 228 and 230 on the second floor, and will have a range of our STATMAT products for sale. Regular followers of Ringmat will have noticed that there has been a paucity of news about Ringmat over the past year or so. There are a number of reasons for this. Firstly, we have outgrown our present premises and have been scouring the UK for an alternative base for the past 2 years. We have now found a new home for both the business and ourselves somewhat more than 250 miles north, on the borders of Yorkshire and Lancashire, and we expect to move there within the next few weeks. There will be a great deal to do to sort out decades of accumulated “stuff” and to get it all packed. Also, to arrange new telephone lines, to install our computer system and to carry out so many other related tasks. We have an exciting new listening room to set up and to tweak. This work will take time, so as from Friday 22nd January 2010 we are automatically redirecting customer orders to Mike at Moth Group, our UK distributor. Mike can be contacted on 01234 741 152 and we shall be in regular contact with him during the move. We have a long-standing holiday booked in March, so although we shall open for a while in March we shall continue to direct customer orders to Moth Group until after Easter, by which time things should have settled down to a more normal pattern. By then, we shall also have our new contact details posted. Secondly, we have been working on a number of new products that we hope to launch later this year without the distractions of travelling around the country every few weeks looking for a new base. Thirdly, we have been concluding our research work on the problems of accurate sound reproduction and now have to condense it all into a comprehensive report that we hope to put up on our Website for all to read. This report should provide answers to most problems and difficulties that music lovers have had in obtaining an accurate reproduction of their treasured records, CDs and DVDs over the past 50 years – problems and difficulties that have not been really covered in magazines and other sources of information in the past, because they were not then fully understood, together with some suggested solutions for the future. Readers will realise from the foregoing that, despite the paucity of news, we have not been idle! Ringmat Record Support System can be found here. Ringmat Pure Signal Blue Interconnect can be found here. Ringmat CDi Blue Statmat can be found here. Ringmat Pure Power Mains Cable can be found here. Ringmat Spike Stoppers can be found here. KUALA LUMPUR INTERNATIONAL AUDIO & VIDEO SHOW (KLIAV) FRIDAY 24TH-SUNDAY 26TH JULY 2009 at the JW Marriott Hotel in Jalan Bukit Bintang, Kuala Lumpur, Malaysia. Ringmat Developments will be represented at this show by our distributor, Electrades Audio who will found in Room 7037 (Level 7). Electrades Audio will be demonstrating the full range of Ringmat products, to name a few, such as the Ringmat Vivacity AR Equipment Platforms, Statfeet, Domes, Speaker Cables, Interconnects, Power Cables and CD Statmat etc. Also Ringmat products will be on sale at special show prices. The first two reviews of the Vivacity AR anti-resonance equipment platforms have now been translated and extracts can be found here. The Show will be held at QUARK HOTEL via Lampedusa 12 and Ringmat Developments will be represented there by their Italian distributor HiFi4music. You will find HiFi4music in their demonstration suite at number 134 on the first floor. They can also be found at their stand at the visitor's entrance where the new Ringmat Vivacity AR Anti-Resonance Equipment Platforms will be on display under the full Ayon/Origin system. The rest of Ringmat range will be demonstrated in the audio suite. Launch of the Ringmat Vivacity AR Platforms in Malaysia - KUALA LUMPUR INTERNATIONAL AUDIO & VIDEO SHOW 25TH-27TH JULY 2008 at the JW Marriott Hotel in Kuala Lumpur, Malaysia. Ringmat Developments will be represented at this show by our distributor, Electrades Audio who will found in Room 7038 (Level 7). Electrades Audio will be demonstrating the Ringmat Vivacity AR Platforms supporting SUGDEN equipment and the playback will be through SPENDOR Loudspeakers. It is hoped that the Malaysian Audio Magazine "Perfect Sound & Vision" will be on sale at the show in which there will be a short mention of the Ringmat Vivacity AR Platforms under "First Tests" where the reviewer has mentioned it as "The Product of The Year - Best Buy". The following issue will carry a full review of the product. The Vivacity AR anti-resonance equipment platforms are featuring well around the world, so much so that we have not had time to post anything recently on this News page, despite some great reviews with more in the pipeline. We are awaiting an English translation of the first review of the Platforms in the Audiophile magazine, Hong Kong, but in the meantime here is the latest magazine cover of Audiophile featuring the Ringmat Vivacity AR Platforms. The Vivacity AR anti-resonance equipment platforms are available now and the new Panels have already been supplied to customers. The latest Press Release will be found here. New prices have been posted and will be found here. Prices at our On-Line Store are being updated and the new products added. Whilst this is in hand, the new prices will apply and as payment is effected off-line the new prices can easily be applied. Where the new products have not yet been added, orders can be placed by telephone. In the new Price List a number of new products will be found in addition to the new Vivacity AR anti-resonance equipment platforms. We have introduced a PLUS version of the Statmat CDi Blue. Early releases of this new version have been very well received by customers who have requested such a version and it should become an established choice alongside the standard CDi Blue. More information will be posted soon. We have introduced a slimmed-down version of the Ringmat Feet without the top disc layer. This new version, called ‘ECON’, has already been supplied to customers on request and provides a useful alternative to the standard Ringmat Feet for those users who feel their requirements are met by these lower priced isolation supports. More information will be posted soon but meanwhile a full explanation is set down in the Price List. We have also introduced a new vinyl product called a Ringmat Base Platter Mat. As the wording suggests, it is a Spacer Mat without the usual stud that is used with Ringmat Spacers. With the Ringmat Support System, there is a much better and deeper bass, with clearer definition than is possible with a Ringmat on its own. Much of this comes from the Spacer Mat and some people have found this answers their need for better bass response without the extra costs of the Ringmat Support System. The Ringmat Base Platter Mat also addresses comments made on some forums that the Ringmat on its own does not provide the degree of bass sought by some users. As previously advised, it is simply not possible to deal with all aspects of accurate sound reproduction from a turntable in a single platter mat, hence the several products that make up the Ringmat Support System. The Ringmat Base Platter Mat, designed for use under the Ringmat, meets the needs of those seeking a fuller, deeper bass response but who cannot immediately stretch to a Ringmat Support System. If required, a stud could be added to a Ringmat Base Platter Mat at a later date for conversion and use within a Ringmat Support System - a truly modular record support system. 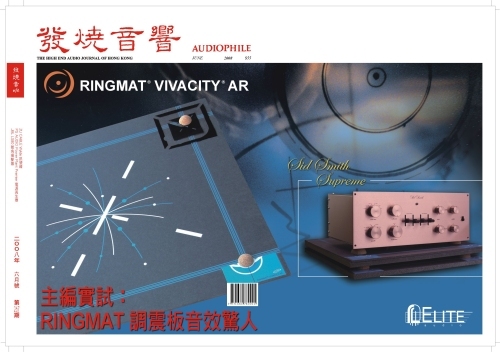 The long awaited Vivacity AR anti-resonance equipment platforms will be available in the second half of March 2008. A new brochure has been prepared and will be found here. Prices will be posted around mid-March 2008. For more information, click here. The new Gold Spot Anniversary has been well received by users who have upgraded from other Ringmats. We have also received an evaluation of the Gold Spot by Christopher Breunig, for many years Music Editor at Hi-Fi News. You will find this review here. The long awaited Vivacity AR anti-resonance platforms will be available in March 2008. A new brochure is being prepared. For an update on our plans for this exciting new product, click here. We have recently installed our first fully specified loudspeaker in our test bed system. We have been designing loudspeakers for many years and various prototypes have been used as evaluation steps towards the present design. As with all our products, its design is unique and far ahead of all others. For more information, click here. We explain here more about the significance and performance of the new Anniversary Gold Spot Ringmat. John Rogers reveals in a new article for this website how Statmat, and the Statmat film, was conceived and developed. It can be found here. The new Anniversary Gold Spot is now available in the UK. Supplies overseas will become available over the coming weeks. We are delighted to report that performance of the Gold Spot itself far exceeds even that of the prototype. The Show will be held at QUARK HOTEL via Lampedusa 11 and Ringmat Developments will be represented there by their Italian distributor HiFi4music. You will find HiFi4music in their demonstration suite at number 134 on the first floor, and purchases can be made at their selling desk at the visitor's entrance. We are about to launch a New Anniversary Ringmat, with much improved performance over the current model. The new Anniversary will be called "Anniversary Gold Spot" and at about 2.9mm thick it will be some 100 microns thinner than the existing Anniversary. It will look very much like the existing Anniversary, but with the addition of a 'Gold Spot'. An even more advanced adhesive will also be used. Performance over the existing Anniversary will be much improved, at least as much again as the present Anniversary over the old XLR. UK retail price (incl. VAT) for the Anniversary Gold Spot will be £80.00, as against £70.00 for the existing Anniversary. The Exchange price to upgrade to the new Anniversary Gold Spot will be £60.00. We shall release Anniversary Gold Spot next month and will also continue with the existing Anniversary. For some weeks now we have uprated the adhesive we use for the XLR to that which we presently use for the existing Anniversary Ringmat. This has the effect of closing the performance gap between the XLR and the Anniversary. In view of the extra costs of the adhesive we now use for the XLR, the UK retail price (incl. VAT) of the XLR has increased from £55.00 to £60.00. Prototypes of the final versions are now installed in our own reference system, with stunning results, far in advance of that which we were obtaining 2 years ago. We are now engaged in completing the updated brochure and the Installation Guide and the other things that will need to be printed. Information relating to price and availability will be released as soon as possible. There has just been another great review of our cables in Hi-Fi+, Issue 49. This time for what is called a 'loom', comprising mains, speaker and interconnect. Other manufacturers' cables have also been reviewed. This is the first time our Pure Power Mains Cable has been covered by a review, as is the case with our Speaker and Interconnects with WBT connectors. Full review and more information here. It has recently been drawn to our attention that two year's ago we received a 5 Star Award from What Hi Fi? Sound and Vision for our Statmat CDi Blue in their Ultimate Guide to Home Cinema 2004. This follows the excellent review of the CDi Blue in What Hi Fi? the year before (see News 17.12.2003). It is especially satisfying to receive an Award for the Statmat CDi Blue in a DVD and Home Cinema context. Details of the Award in the Ultimate Guide can be found here. In 'Santa's Goody Bag ...', a round up of Hi-Fi Accessories for Christmas in Issue 48 of Hi-Fi+, the Editor, Roy Gregory, includes the Statmat CDi Blue. He says it "remains a staple part of CD replay chez Gregory. Richer, sweeter, more natural but above all more dynamic sound is the result, increasing musical enjoyment and involvement while at the same time reducing listener fatigue. This is arguably the single most cost effective upgrade you can make to most CD players. ... It also serves as an intriguing introduction to Ringmat's world of accessories and system tuning devices." The Hi-Fi News Show 2006 will again be held at the Renaissance Hotel, Heathrow from 22nd-24th September 2006. In addition this year there will be the London Sound & Vision Show at the Park Inn Hotel almost opposite during the same period. We regret that we will not be able to attend the Shows this year as John has just had a new knee replacement operation and will be unable to stand for any length of time. However, a range of our products will continue to be available at the Moth Group/Hi-Fi News Accessories stand in the Renaissance Hotel. The stand will, as usual, be on the ground floor just beyond the entrance door. We wish you all an enjoyable time at the two Shows and look forward to seeing you again another time. WELL EVER INVESTMENT LTD, distributors of Ringmat products in Hong Kong, will be participating in the Hong Kong Hi-Fi Hi Fi / Hi Vi Show 2006 at Langham Place Hotel, 555 Shanghai Street, Mongkok, Kowloon, Hong Kong. A notice board at the entrance to show will indicate the location of Well Ever Investment Ltd. The show takes place on Friday 22nd September and Saturday 23rd September 2006. A range of Ringmat products will be available at the show and Well Ever staff will be pleased to demonstrate them. HIFI4MUSIC, distributors of Ringmat products in Italy, will be participating in the Milan Hi-Fi Show known as "The Top Audio Show". They will be on the 3rd floor in room number 317 at the Quark Hotel during the show which runs from Thursday 14th to Sunday 17th September 2006. A range of Ringmat products will be available at the show and HIFI4MUSIC staff will be pleased to demonstrate them in room 317. HIFI4MUSIC will also have a sales stall at the entrance to the show. Electrades Audio, distributors of Ringmat products in Singapore and Malaysia, will be participating in the Kuala Lumpur (Malaysia) Hi-Fi Show known as "KL International AV Show 2006". They will be in Rooms 7016 and 7018 at JW Marriott Hotel during the show which runs from Friday 21st July to Sunday 23rd July 2006. A range of Ringmat products will be available at the show and Electrades staff will be pleased to demonstrate them. We have just launched a new '2nd Edition' of the well regarded booklet "How to Set Up and Fine Tune a Turntable" by John Rogers. The newly launched Vivacity product line now has a brochure, for an advanced preview click here. Electrades Audio, our distributor for Singapore and Malaysia, will be participating at The Singapore Hi-Fi Show, where our products will be in use. The Show will be held at LeMeridien Hotel in Orchard Road from Friday 4th to Sunday 6th November 2005, from 9am to 7pm daily. Electrades Audio will be in Rooms 501 and 502 and look forward to welcoming you. The new products we shall be launching at the Hi-Fi & Home Entertainment Show at the Renaissance Hotel, Heathrow, London next week have now been included on the prices page. More details will be posted after the Show and later in our Online Store. We can now release more information about the exciting new anti-resonance solution for hi-fi and home cinema systems that we announced last week, and which will be shown in prototype at the Hi-Fi & Home Entertainment Show, Renaissance Hotel, London Heathrow, 23-25 September 2005. We can reveal that we have partnered with NXT to deploy its unique Distributed Mode Loudspeaker technology with our new Vivacity AR controlled resonance panels. For more information, please click here. Visitors to the upcoming Hi-Fi Show at the Renaissance Hotel, Heathrow (24th & 25th September) will have the opportunity of a preview of Ringmats exciting new anti-resonance system, called Vivacity AR. For more information, please click here. We will be at the forthcoming London Hi-Fi Show at The Renaissance Hotel, Heathrow, and shall look forward to seeing you there. You will find us on stand 3A on the ground floor to the right as you pass though the main entrance, next to the Hi-Fi News Accessories stand. We shall have a host of new products and exciting ideas for the coming year to show you and talk about. Come and find out about our new Mains Cables, our extended range of Ringmat Feet, the new Spike Stoppers and Statmat Plus, amongst other things. The Show is open to the public on Saturday 24th and Sunday 25th September from 10am - 6pm and again extends to The Park Inn (formerly Le Meridien) opposite. There is a special 2 for 1 ticket offer online at www.hifinews.co.uk. To read more about Ringmat Spike Stoppers, and see some pictures, click here. As a result of recent in-house research, we have updated our advice on hi-fi and home cinema systems. Please click here to view the page. As mentioned in the article, further updates are planned later this year. We have a new price list starting from 1st February, showing some of our new products. Some of these are for release over the next few months and further information will be posted on them nearer the time. Yet more products are under development for release shortly thereafter. The new Ringmat Feet include replacements for the old LW and HD models, as well as catering for equipment up to 69kg. For pricing please click here. The Ringmat Spike Stoppers are designed to be placed under spikes traditionally used for stands and loudspeakers. Not only do they protect floors but also improve sound quality from the equipment supported by the Spike Stoppers. Existing users of Ringmat Domes will be familiar with the sort of performance obtainable from the Spike Stoppers. For pricing please click here. More details about the new products will be posted soon. We would also like to draw your attention to the fact that there is an Adobe Acrobat (PDF) format downloadable version of the new pricelist here. Ringmat Developments are pleased to announce details of their latest Ringmat Feet, click here for more information. We will be at the forthcoming Manchester Hi-Fi Show, Northern Sound & Vision 2005, at The Radisson SAS Hotel, Manchester airport on Saturday 29th January and Sunday 30th January, and shall look forward to seeing you there. You will find us opposite the lifts on level 2. We have a host of new products for release this year. Many of the new concepts will be on display at the Show, including: Ringmat Anti-Resonance Platforms; 5 new models of Ringmat Feet, including those for equipment weighing up to 69 kilos; Ringmat Cabinet Dampers; Spike Stoppers; Ringmat Pure Power Mains Cable; and the Ringmat Pure Signal tonearm cable. The Show is open to the public on Saturday from 10.00am - 5.00pm and on Sunday from 10.00am - 4.00pm. At the London Hi-Fi Show at The Renaissance Hotel, Heathrow, last weekend we showed a number of new products which we shall be releasing during the course of the coming year. We will be at the forthcoming London Hi-Fi Show at The Renaissance Hotel, Heathrow, and shall look forward to seeing you there. As usual, you will find us sharing the Hi-Fi News Accessories Club/Moth Marketing stand on the ground floor to the right as you pass though the main entrance. We shall have a host of new products and ideas for the coming year to show and talk about. The Show is open to the public on Saturday 25th and Sunday 26th September from 10am - 6pm and again extends to The Park Inn (formerly Le Meridien) opposite. There is a special 2 for 1 ticket offer online at www.avexpo.co.uk or by calling the Show hotline 020 8726 8318. Another great and very detailed review of the full Ringmat Support System has been written by Paul Szabady, Senior Editor, The Stereo Times, and posted on their Website. For more information, click here. From changes made to this site viewers will be aware that we now have our ONLINE RINGMAT STORE operational and we hope this will make it much easier in future to buy Ringmat and Statmat products direct. Prices displayed in the Store exclude UK Value Added Tax, which will be added at the current rate to the final invoice cost for UK and other EU customers. Overseas customers should note that, for those countries where we have existing distributors or dealers, orders received by us through the Online Ringmat Store will continue to be directed to our overseas agents for completion at local prices and conditions. Trade customers should continue to use the connections listed in our CONTACT US page. We get so many letters and 'phone calls from customers about how pleased they are with our products that it would no longer be appropriate to include them on our Website, though in the very early days extracts from some of them were published. However, a particularly interesting letter (click here) has recently been received from one of our customers concerning his experiences with our Statmat CDi Blue product. This follows his delight earlier with our MkII CDi, the single film version of the Statmat. One of the reasons we have included this letter is that Mr. Wynne-Jones' experiences were similar to those we have had during our development work and it is interesting when these are described by someone else. We would mention that where Mr. Wynne-Jones has made reference to shortcomings in listening to certain recordings, we have already discovered many of the reasons for these. The reasons do not relate to the performance of the Statmat, but to conceptual errors within the industry as to how sounds should be recorded and then reproduced. This very important matter, including how to avoid or correct the problems that exist at the moment, will be the subject of subsequent press releases and postings on this News page. Another excellent reference to the Statmat CDi Blue, this time in a round up of bargain "System Boosters" in the UK's largest circulation Hi-Fi magazine, What Hi*Fi. For more information, click here. An excellent short review has been given to the Anniversary Ringmat in the December 2003 Issue of Gramophone in a 2 page section on System Accessories. For more information, click here. At the London Hi Fi Show at The Renaissance Hotel, Heathrow, in September we launched a number of new additions to our range of cables. For details of our new Digital Interconnects, click here, and for our new Power Line Speaker Cables, click here. Our speaker cables can now be also be terminated with insulated WBT connectors. We continue with our research into new products and improved methods of sound reproduction and news on these will be posted when available. We will be at the forthcoming London Hi Fi Show at The Renaisssance Hotel, Heathrow, and will be pleased to see you there. As usual, you will find us sharing the The HiFi News Accessories Club/Moth Marketing stand near the main entrance . The show is open to the public on Saturday 27th and Sunday 28th September. Hi-Fi News, the British hi-fi magazine, has a new Website www.hifinews.co.uk. At the time of writing, it details the contents of the May 2003 Issue and previews the June Issue. This excellent report is very much in line with what we, at Ringmat Developments, would have expected and is a pretty accurate appraisal. Keith was at great pains to warn that these findings were not his final conclusions and that he regards this as a first step and very much ‘work in progress’. Current versions of Statmat products have been sent to Keith to assist him in his work and we await any further results with interest. If you want to know more, buy the magazine. We have posted 2 new pages to the Website. One is an update to a short article John wrote for a magazine on the question: “After getting a Ringmat for my turntable, what should I get next to improve its performance still further?” To read the answer, click here. The other page is based on a new product insert we shall be introducing shortly to accommodate instances where customers notice an unwanted change in sound quality when incorporating our products into their sound reproduction systems. Although there can be obvious reasons for this, such as failure to read the instructions, we have found two causes in particular that are often overlooked but can be easily remedied. This guidance is relevant not only to our own products, but also in respect of those of other manufacturers. To find out more, click here. Although we shall not be exhibiting at the Bristol Show on 21st – 23rd February, some of our products will be available there at the Hi-Fi For Sale stand. We are also providing standard MkII CDi Statmats to Hi-Fi World for their magazine subscription promotion at the Show. This will also include an offer to those who take up a subscription to Hi-Fi World to upgrade from the standard Statmat they will receive a to CDi Blue at a special price. Last Autumn we introduced a MkII version of the Ringcap. The new Ringcap uses the same advanced adhesive for its single ring as is used for the Anniversary Ringmat, with comparable improvements to sound reproduction in proportion to its smaller size. There is no change in price. position to release some information on our work, hopefully later this year or early next year. This research is related not only to the improved accuracy of the signal due to our Ringmat isolation products and cables and to our Statmat film products, but also to our progress on the design of new products, the results so far exceeding expectations. However, it is difficult at this time to predict any release dates. We will be at the Manchester Hi-Fi & Home Cinema Show to be held at the Hilton Manchester Airport Hotel on Saturday and Sunday, 16th - 17th November. We are very much looking forward to seeing you all there. We had another excellent "Show" at London Heathrow earlier this month, organised by Hi-Fi News, with lots of interest in all our products, especially in the new Ringmat Pure Signal Interconnects and Ringmat Pure Power Speaker Cables. Shortly before the Show, we were informed of two more great reviews for the CDi Blue Statmat for CD, DVD and SACD players and transports. The first will be found on the internet hi-fi magazine POSITIVE FEEDBACK ONLINE - ISSUE 2 click here. Here we have three modifications to the Cary 306/200. Firstly, a large number of Marigo Dots were applied, followed by four Shakti On-Lines, then the CDi Blue. I asked Dave Clark, who wrote the review, for confirmation that the CDi Blue was used with the others still in place, to which he replied in the affirmative, adding "I felt the mat was the cherry on top!" Dave is now looking forward to the opportunity to try out some more Ringmat products. The other was not so much a review as a news item. It was in the UK's highest circulation "hi-fi" magazine, WHAT HI-FI? SOUND AND VISION. Lovely full colour picture but barely any text, but what it said was all that was necessary: "We were sceptical, but this tiny plastic mat can make a real difference to your CD/DVD sound, by dispersing low-voltage static as you spin your discs." Short and sweet! We have now posted the first review of the Ringmat Audiophile Cables. At the end of the review there are some comments by John Rogers to assist the reader in putting it all in perspective. Did we say the review was "fabulous"? See for yourself click here to read it. We have a NEW Product and Retail Price List. It includes the prices of our NEW PRODUCTS, including the new Pure Signal Interconnect Cables. You will also notice that some prices have been reduced, though we have had to make a small increase in the prices of the Ringmat LP Record Support Systems to cover the increased costs of the Yellow Ringmat Spacers. We have just had a fabulous review of our Ringmat Audiophile Cables by Roy Gregory in the recent Sept - Oct Issue of Hi-Fi+ magazine. More about this soon. Now for something completely different. Cue and Review provide a recordings review service for the blind and partially sighted which has recently covered the benefits of using the Statmat CDi Blue when listening to CDs. Called "Sound Explosion", we have now taken excerpts from their review and included them in a Windows Media Audio (WMA) format for you to listen to for yourself. Click here to hear the review. For more information about the service, go to www.cueandreview.org.uk or e-mail information@cueandreview.org.uk or telephone ++44 (0) 141 563 0306 / 0307. There has been another gap of a few months since we last posted some news. Part of the reason for this has been that we continue to be too busy with the success of our products to find the time to write about all that has been happening. But mainly it has been because we have been waiting to announce the arrival of our own Ringmat Pure Signal and Ringmat Pure Power Cables. We will be introducing the Ringmat Pure Signal interconnects and the Ringmat Pure Power speaker cables at the London Heathrow Hi-Fi Show in September (Saturday and Sunday, 14th and 15th) and are absolutely delighted with their performance. You can read all about them here. Also being introduced at the September Show will be MkII versions of our Ringmat Feet and some Mini Domes to augment our Ringmat Dome range. Since their introduction in 1999, Ringmat Feet have been steadily improved in performance as changes have been made in the materials used. Now, following some further changes in the adhesives used (which had such a big impact on the performance of the new Anniversary Ringmat) it is time we packaged them as the new MkII versions. The Mini Domes were designed to be used with the Ringmat Anti-Resonance Platforms, which we hope to introduce before long, but are also useful where the existing Small Ringmat Domes provide a profile which is too high. The Mini Domes have a height of just over 9mm, whereas the Small Domes are some 19mm high. Remember, the Domes are superior in performance to any spikes, cones or other hard isolation support devices, and when used in conjunction with Ringmat Feet, provide the best possible support and performance for all your hi-fi and audio visual components. See what we say about our ‘Soft Feet’ approach in our previous news posting. If you are able to be at the Show, we look forward to seeing you there. As usual, there will be some special offers on our products, and introductory prices on our Pure Signal interconnects and Pure Power speaker cables. Prices for our new products will be posted shortly. Demand continues to be slightly ahead of our capacity to produce, though delays in fulfilling orders are now fairly short. The following Issue of Hi-Fi+ showed the new Ringmat Anniversary featuring in an article on upgrade options for second-hand Linn LP12s. The next Issue, September/October 2002, will include the first review of the new Ringmat Pure Signal interconnects and the Pure Power speaker cable. Ringmat products have featured in two articles in Hi-Fi World on the subject of upgrading your hi-fi system. In the June 2002 Issue, David Price and the editor, Simon Pope, listened to see what benefit could be found in using the Statfeet on their own. Their conclusion? “Now, perhaps this all sounds like hocus pocus. And you’d be right in thinking as much, except for one thing: The fact that they actually work!” Of course, they work even better when used with other Ringmat and Statmat products, but the point of our submitting them to be used on their own was to subject them to a test to demonstrate that they do actually work, even on their own. The second article appeared in the September 2002 Issue and focused on the Ringmat Support System, including the new Anniversary Ringmat and the new LP Blue Statmat. The editor, Simon Pope, is new to our products and displays quite a lot of caution, of which the following is revealing: “I’ve played around with a few Ringmat products previously and found them to work well (and being a bit of a cynic, I’ve had to swallow humble pie).” Then later: “I then used the system as a whole with and without the Ringcap. On both occasions there was further evidence of improved detail and clarity and once again had humble pie for tea.” And the World Verdict? 3½ stars out of 4! With the comments: “Ultimately the system makes subtle yet defining changes to your vinyl collection” and “Dare I say it, it’s even a bit of fun – which is no harm in the somewhat po-faced world of hi-fi!” Not bad. We were then given a full page review of the new Anniversary Ringmat, LP Blue Statmat and Statcap in the September 2002 Issue of Hi-Fi News. Whilst initially being sceptical that a few holes cut in the paper and a different adhesive might make the Anniversary outperform the XLR, Christopher Breunig (CJB) had to admit that: “... there really were changes to the imaging and dynamics, etc. As Rogers suggests,, wider soundstages were created and definite increases in tonal definition perceived – notably with a mono Westminster LP of Scarlatti keyboard sonatas.” When the XLR and standard LP Statmat were replaced by the Anniversary , LP Blue and Statcap, and using the products on his Linn LP12 with the other modules of the Ringmat Support System, CJB observed: “... the opening side-drum taps were sharper, the double-basses more focused, the bassoons’ phrasing more pointed, then the paired oboes more easily analysed, ... (there was) increased tunefulness and vocal nuance, and cleaner separation, with a dryer, more focused plucked bass.” CJB concluded: “Whilst these items stack up in cost – as well as physically! – they don’t amount to much relative to the turntable, arm and cartridge outlay, and in my view the sonic changes more than justify investment. And it’s nice to feel once more that the extra effort involved with the software, in getting things to sound just right, brings a reward of its own.” Amen to that. Finally, we have to report that the decline in the quality of the transports used in some computer systems (perhaps inevitable in the face of fierce competition) means that not all computers can benefit from using the CDi Blue. Accordingly, some users may need to use the single film Statmat MkII CDi for their computer, and perhaps for certain DVD machines, whilst using the CDi Blue for their hi-fi system and for most audio visual set-ups. There has been a gap of a few months since we last posted some news. The reason for this is that we have been too busy with the success of our products to find the time to write about all that has been happening. For most of our products, demand continues to outstrip our capacity to produce, though we have constantly kept our nose grinding on the production bench. We nevertheless feel we can now see the light at the end of the tunnel and that before long production and stock levels will be on more of an even keel. Production of our new cables with our own name and colours should take place shortly, so provided all has gone well we hope to be able to bring them onto the market during the Summer months. We have almost finished the anti-resonance platforms in their new prototype form. We have had prototypes in use for some years, which outperformed anything on the market we had previously tried, but they were too expensive to make commercially and there were aspects of their design which we felt we could improve upon. The new prototypes outperform the original ones, so we now have to move towards putting them into a final marketable state. Meantime, we have had some wonderful reviews of our new products. Our new Statmat, the CDi Blue, has had 3 reviews, in Hi-Fi+, Audio Video South Africa (AVSA), and High Fidelity (Denmark) magazines. The review in High Fidelity also featured our new Anniversary Ringmat, our new LP Blue Statmat and Statcap and other modules of the Ringmat Support System, click here to read the review. Particularly interesting were the reports in AVSA and High Fidelity magazines as to how the new CDi Blue Statmat improved the picture quality as well as the sound in audio/visual systems. This has been known for some time, as many customers have been regularly reporting it to us, saying how amazed and pleased they were. Further improvements in picture quality, as well as sound, can be obtained by using Statfeet under televisions and video recorders. We have also had the first review of our "soft feet" approach to loudspeaker support. Traditionally, the advice has been to support speakers with "spikes" or hard "cones". The Danish hi-fi company Holfi drew our attention to the work done by the Swedish company Sonic Design in finding a better means of support for speakers, using their SD Damping Feet. For a technical appraisal of the “soft feet” approach and links to the Sonic Design Website and reviews, click here to review the technical appraisal. However, Holfi discovered even better results using our Ringmat Feet under the SD Damping Feet, but we, in turn, found yet an even bigger improvement using our Ringmat Domes in place of the SD Damping Feet. Our existing Ringmat Feet and Domes provide excellent "soft feet" support for loudspeakers and other components, as you will read in the Hi-Fi+ reviews. As reported, we are working to develop extra large, extra heavy duty Ringmat Feet to use under those speakers and other equipment that weigh more than 21k. Watch this space. The new LP BLUE STATMAT and STATCAP for LP sound reproduction were launched at the Manchester Hi-Fi Show on 17th/18th November 2001. Feedback from users has already been pretty ecstatic, much the same as with the introduction of the CDi BLUE for CD reproduction in September. We have also had another excellent review for the Ringmat Feet and a first review of the Ringmat Domes by Dave Ayers in the British magazine Hi-Fi+. The Feet are like mini plastic Ringmats and are designed to be used under a component's own feet on a shelf or platform (or on the floor underneath Domes in the case of speakers). The Domes (which look like conventional cones without a 'point' and are made of compressed cork) were conceived as a means of support where a component has no feet of its own to enable the component to rest upon Ringmat Feet. This is especially so in the case of speakers. However, use of the Domes on Ringmat Feet in place of a component's own feet can bring even greater rewards in improved sound quality, as is explained in the aforementioned review. The only caveat for the use of Domes in place of a component's own feet is where the base plate of the component is not suitable to sustain support other than where its own feet are positioned. Remember, whenever a change is made in a highly tuned sound reproduction system, there is usually an effect on the 'loading' of the system and/or in the phase of the signal. Changes in the phase of a signal alter the timing of sound waves from the speakers throughout the frequency range. Any changes in 'loading' and the phase of the signal often require to be compensated by minute adjustments to the position of speakers in relation to a rear and any other reflecting walls and in the degree to which speakers are 'toed-in'. Such changes in speaker positioning may amount to less than 5mm (maybe only 2 to 3mm), but unless such corrections are made, the full benefit of improvements to a sound reproduction system may be only partially realised. At the Hi-Fi Show in London earlier this month, we introduced a number of new products and upgrades. A summary of Ringmat and Statmat products for the 2001/02 Season can be found in the product section. There is also a new price list. There is an unsolicited review of Statmat in the current (July 2001) edition of Gramophone magazine, the first review of one of our products in that august publication. Patrick Fraser, in his appraisal of a number of ‘aftermarket’ products aimed at improving sound quality, identifies Statmat as "the first stop" for anyone looking to enhance CD performance. His review gives several examples of the improvements obtained by using Statmat, the strange thing being that he was reviewing the Mk II version, which was superseded by the CDi nearly 2 years ago. It is an excellent article, nevertheless. He is quite right that in an age of ever increasing reliance upon electronics in metal boxes, we still have to combat the tiny vibrations generated by the components within the equipment, the vibrations generated in the air and through the floor, as well as unwanted electromagnetic currents. All these are issues for which our products already provide many solutions, and new products in the pipeline will bring even further benefits. We are working at a feverish pace on a range of new ides. Watch this news page! There are two new reviews of the Statmat now posted. One by Bjarne Jensen (Hi Fidelity) and another by Deon Schoeman (Audio Video South Africa). You can read those here. When Bjarne Jensen reviewed the Ringmat Feet at a later date, he referred to the MkII CDi, commenting that this new version was now available. He added that it was at least as good as the earlier version but was easier to use. Ringmat has always had many adherents in Germany since it was first launched, but we have only recently had a review of the current XLR version of the Ringmat 330 MkII. An English translation of the review, which appeared in the Summer of 2000, is now available, click here to read that review. Still on the subject of Ringmat, Jimmy Hughes has again been singing its praises. In a round up of ways in which sound reproduction can be improved ("Gilding the Lily" - Hi-Fi Choice Best Buys 2000 Edition), Jimmy now says that the Ringmat is "quite possibly the finest turntable mat ever produced". He also believes the benefits go beyond improved sound reproduction, by extending cartridge life and reducing record and stylus wear. This can be gauged by the difference in the quality of stylus needletalk, where this is reduced when using Ringmat. He reiterates the point made by Dave Ayers in his review of the Ringmat and the Ringmat Support System, that the improvement also holds good for turntables designed for use without a mat - including those where the manufacturer provides for the record to be clamped straight onto the platter. Jimmy also mentions the improvement brought about by the CD Statmat, it raises an interesting point regarding static which we have been researching and which will form part of a new range of products due out later this year. We don't know how many readers have the British magazine "CLASSIC fM", but in the February 2001 issue, under the interesting headline "skip the jumping", the contributor reports that in "a trial of three known suspects" in his collection, the Statmat produced "perfect results". Is this the outcome manufacturers had in mind when CD was originally launched, with the claim to "the perfect sound"? Perhaps not, but it was good to have this brief mention and to bring to the attention of others the improvements in sound which can be achieved by using this product. Moreover, from our latest research, we believe there is still quite a long way to go before we run out of ideas to improve CD sound reproduction. Watch this space! Readers of our news pages will be aware of our co-operation with the high-end Danish manufacturer Holfi. See our news on 08.03.2000. In recent weeks, Holfi have been installing their hi-fi systems in the homes of certain prominent, internationally famous musicians. You can read about this on their news site. The significance of this for us is that the performance of these systems is securely based on the use and combination of our products, especially the Ringmat Feet, with the Holfi equipment. Of course, our products can be used with all and any makes of equipment, and other manufacturers also recommend Ringmat products, but Holfi have recognised the importance of our products in delivering a level of performance which they can confidently take to world renowned musicians, knowing that the sound reproduced will be just what was heard at recorded performances by these musicians. Thomas Dausgaard, starting a new series of recordings of Beethoven symphonies with the Swedish Chamber Orchestra, on Simax, using the brand new Barenreiter/Del Mar editions, to rave reviews, has written: "To Holfi: You make it sound as we intended". n turn, we have recently acquired the Holfi top-of-the-range CD player (the Xara NFB Rex) for our listening room, having been so impressed by its performance during a visit to Denmark last year. We have not been disappointed. It provides just the level of performance for which we have been looking in order for us to fully and accurately evaluate the research work we are doing for the development of new products. The battery powered output, using a non-feedback, Class A, single-ended analogue amplifier, produces a gorgeous sound. We have also tried the suggestion made in the High Fidelity magazine article by Bjarne Jensen that an improvement in sound can be gained by ‘earthing’ Loudspeakers. (See news item 20/05/2000). We loosened just one bolt per drive unit (where the drive unit is affixed to the front baffle) in the first speaker and hooked a bared end of a length of insulated wire over it and retightened the bolt. The lengths of wire were taken down the front of the speaker (behind the front cover) and underneath to the back of the speaker. Here they were fed into a simple wire connector, and from the other end of the connector a fresh length of wire was connected to the earth pin of a convenient wall socket. The wire and the connector were taped to the loudspeaker so that it looked tidier. We then did some comparative listening tests in mono. It was immediately obvious that with the speaker ‘earthed’ the sound was a lot cleaner, more transparent, with more space around the sound and greater depth. The sound sources seemed to be more clearly layered, according to the position of the artists. The foregoing was repeated with the other speaker, with the same results. With both speakers and in stereo the improvement to the sound was significant and well worth the time taken to do such a simple upgrade. Those of a DIY mind who are confident they know what they are doing may prefer to carry out the connections inside the speaker and provide an extra terminal on the back plate of the speaker. We are pleased to report that we have now officially received our Certificate of Grant of Patent for Statmat as an invention for 'Compact disc playing arrangements'. Another wonderful review of the Ringmat Feet has appeared in the Danish and Swedish Editions of High Fidelity magazine (4/2000). You will find an English translation in our Review section. We shall be trying the loudspeaker earthing tweak ourselves in due course (see the above mentioned review). Incidentally, we have now removed all fuses from the mains electricity supply to our test system, relying just on the fuses in the equipment. Combined with the introduction of our own prototype mains cables, the improvement in sound reproduction is staggering. More on this later. Lots of references to Ringmat products in the latest edition of hi-fi+ magazine. In a series of reviews of high-end record players, it was found that use of the Ringmat made a significant improvement to the sound. In his review of the Avid Acutus Turntable, Jimmy Hughes comments: “However, it’s possible to circumvent the clamp by using a QR Developments Ringmat. Subjectively, I felt this worked very well with the Acutus, and, were I lucky enough to own this amazing turntable, that’s how I’d use it ...”. Reviewing the Garrard 501 Turntable, which came with a fairly thin cork mat, Jimmy again comments: “I also used the QR Developments Ringmat with very good results, and this would be my choice... “. The DNM/Reson Rota 1 Turntable comes with a Ringmat anyway, as it was for this turntable that the Ringmat was originally designed. As regards performance, Roy Gregory says: “In use the Rota 1 is amazingly crisp and dynamic. Stable and focused, the music absolutely bounces with life and energy. In fact the whole sound is surprisingly big for a turntable of such slight dimensions and minimal weight. Much of this is down to its transparency and resolution, qualities in which it excels, and which combined with the dynamics make for a vivid (and highly enjoyable) listening experience.” These are all qualities that are usually found whenever a Ringmat is in use, almost irrespective of turntable. Elsewhere in the issue, in a section called ‘Audio Smorgasbord’ (yes, in a UK magazine! ), Dave Ayers investigates the effect of static on CD reproduction. In part, this was prompted by his experiences using Statmat, as reported in the previous issue of the magazine. For those who had short memories, or who had not read that issue, he gave a brief “recap” of the ‘plot’: “I liked the effect of the Statmat so much I now use it all the time. Or in more detail: using the Statmat wrought improvements in all areas of CD sourced music; particularly in rhythmic integrity and emphasis, in reducing perceived distortion, in opening up the sound stage and improving detail resolution.” Dave then continued to recount his experiences using various ways in which to reduce the effect of static on CD reproduction, including washing and then drying CDs, using the Zerostat pistol, the Nordost ECO 3 spray and Statmat. Whilst some of the products produced a cumulative effect when used together, the clear winner was Statmat. Also in ‘Audio Smorgasbord’ is a review of the Incognito Rega VTA Fixer, surely of interest to all those users of Rega/Moth tonearms, and of the Digital Levelling Gauge from the Cartridge Man. In South Africa’s only Hi-Fi magazine, Audio Video (March 2000), there is a review of the Ringmat Support System by Deon Schoeman. The verdict: “Rather oddball but extremely effective turntable tweak. Requires careful set-up and unhurried experimentation. Bigger soundstage, improved tonal range and greater clarity the reward.” Fuller extracts will be found in the reviews section. The first UK review of Ringmat Feet has just appeared in the April 2000 issue of Hi-Fi Choice. "At best, Ringmat Feet produce an improvement comparable to the Townshend Loudspeaker Seismic Sinks I raved about last month. Taking a set of Feet to a friend's house and using them under his DNM pre-amp, the effect on the music was magical." The first full review of the third generation STATMAT has just appeared in Hi-Fi+. This latest version of the STATMAT (Mk II CDi) was launched at the London Hi-Fi Show in September 1999. Another review of the latest STATMAT is due in the Danish 'High Fidelity' magazine expected in the May 2000 issue. This will also include a review of Ringmat Feet. We also hope that a review will also appear in the Swedish edition of this magazine. The highly respected Danish Hi-Fi manufacturer Holfi now regularly use STATMAT and RINGMAT FEET when demonstrating their products.